DC and Marvel comics have between them produced not only among the most iconic comic book characters of all time but among the most recognisable fictional characters. The impact characters like Batman, Superman and Spider-Man have had on popular culture could almost be considered a superhuman feat itself! However which is superior Marvel or DC? Well I obviously can’t answer that objectively as no one can so instead I am going to offer up my reasons as to why I feel that DC is superior to Marvel. Please feel free to tell me who you prefer in the comments below and also what you think of my points in favour of DC. All opinions are welcome. As much as I like the Marvel characters I think its true that Marvel does tend to often make its most recognisable heroes at least, mutants. Take a look at Spider-Man, the Fantastic Four, the X-Men, Daredevil, the Incredible Hulk, Ant Man, even Captain America. They are all mutants in some way. Spider-Man, Fantastic Four, the Hulk, Daredevil are all the result of an accident involving radiation of some kind. The X-Men meanwhile are created from a natural mutation whilst Captain America and Ant Man are created from an experiment. Obviously not all of Marvel’s heroes follow this formula. Characters like Thor, the Silver Surfer and Iron Man don’t fit the mutant pattern. It would also be wrong to say that Marvels characters are all similar in terms of their characterisation. Still as so many of them are the result of a scientific accident then a lot of them do tend to explore the same basic idea of science gone wrong. Many of their heroes are scientific geniuses too like Reed Richards, Peter Parker, Bruce Banner, Professor X etc. DC comics characters meanwhile I feel have a greater variety to them in terms of their origins and genre’s. Look at the main DC rooster and you will see that they are all vastly different. Batman is like a weird cross between Sherlock Holmes and Dracula. He is an ordinary human with no powers. His series also explores themes such as revenge and incorporates elements of Gothic and horror fiction, detective stories, and even at certain points gritty crime dramas. Batman as a hero is a very quiet, reserved, mysterious and dark character. He is motivated by a tragic event in his past. Later stories even hint that he himself is mentally unbalanced! Superman meanwhile in terms of powers and abilities is virtually a god. He is also an alien from outer space who battles gigantic robots, mutant dinosaurs, alien tyrants, and geniuses who can invent time machines! His stories naturally draw on science fiction stories for inspiration instead. Superman as a character is also a well adjusted, happy, positive character who fights because he thinks it is the right thing to do. Wonder Woman is a fantastical character. She is created by the Greek Gods and naturally her stories draw on old Greco/Roman myths for inspiration instead. Wonder Woman also having spent her entire life on an island separated from the rest of the world, is very much a stranger in a strange land type of a character. The Flash is much like the majority of Marvel heroes a mutant and thus can deal with the science gone wrong like they do. The various Green Lantern’s are like an odd mix of fantasy and sci fi. He is someone who has been gifted with a power ring by the Green Lantern Corp. A kind of interplanetary police force made up of aliens from across the entire universe. Aquaman is a hero from under the ocean and thus completely divorced from the outside world like Batman, Superman and the Flash who still live in cities. As you can see its not easy to lump all of DC’s main heroes together into a category of just being mutants. Some are mutants, some are ordinary people, some are greek gods, some are men from beneath the sea, some are aliens from outer space! I feel this makes it more interesting when DC’s heroes meet. When the Hulk and Spider-Men meet its exciting yes, but when Batman and Superman meet it really does feel like two whole worlds clashing. You have one hero who deals with purely evil humans, relies solely on gadgets, deductive skills, who is motivated by personal vengeance, operates in the dark of night and uses fear, and then we have one hero who is an alien from outer space with limitless power, who is used to fighting gods and monsters and who is motivated purely by the desire to do the right thing. How would these two characters work together? One is an alien and might challenge everything the other one ever thought? One might see the other one as less of a hero because of his lack of powers? Superman might also clash with Batman’s more violent methods and see him as bitter and twisted whilst Batman might see Superman as too soft? Its not just simply a case of two heroes with different powers meeting. It runs much deeper than that. Thus for all of these reasons I feel that DC has a more varied rooster of heroes. A problem I have with Marvel is that most of its heroes live in New York. Now not only do I find this somewhat repetitive but it also does lead to a bit of a problem in that technically you shouldn’t be able to walk 5 feet in New York without bumping into a superhero. Even just robbing a bank should bring in Spider-Man, Daredevil, X-Men, and the Fantastic Four! DC meanwhile tends to give each super hero their own city to operate in. With Batman we have Gotham, a dark, gloomy, atmospheric city filled with big Gothic cathedrals, areas that are just complete slums, dark, horrible, little alleyways etc. Metropolis on the other hand is the complete opposite of Gotham. Its bright, its buildings look futuristic, it looks like a happy, nice place to live. Both cities almost reflect the heroes who live in them’s personality’s. Gotham is broken and damaged like Batman, whilst Metroplis, is bright, advanced and sunny like Supes himself. Personally I find it more interesting to actually create almost a whole world for a hero to inhabit rather than simply dumping them in a real city. Now a problem I think that arises from so many Marvel heroes being accidents caused by radiation is that technically there should be more than one version of them. For instance Doctor Doom knows that flying through those cosmic rays created the Fantastic Four right? So why doesn’t he just send his own spaceship up there and gain the Fantastic Furs powers or similar super powers? 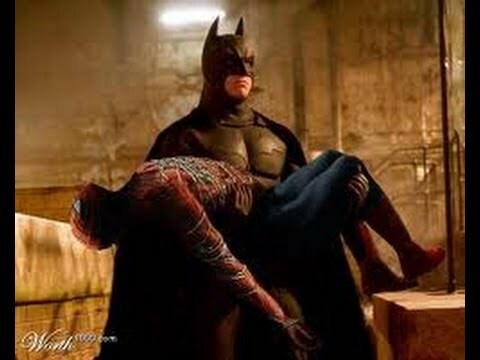 Similarly what happened to the Spider that bit Peter Parker? Did it bite anyone else, in which case there should be another Spider-Man? Also even if that Spider died then couldn’t the radiation that created it have created another one? Its not so unreasonable to assume another Spider would fall into its light and mutate it the way the previous one was mutated. The Hulk’s origin meanwhile is completely nonsensical. Leaving aside the fact that being hit by an Gamma bomb should have killed him, what kind of a bomb not only can’t kill one human, but actually transforms them into an unstoppable killing machine! Imagine if the USA had dropped this bomb on one of their enemies cities. They’d give their enemy an army of the most unstoppable monsters to use against them. Worse still is when you consider that this bomb was designed by one of the greatest minds on earth. Seems to me Doctor Banner’s intelligence is overrated if he designed a weapon that would have made his enemies unbeatable! Batman’s origins make sense. He is traumatized by what happened to his parents and vows to make sure that that will never happen again. Its a specific event that happened to him and it all depends on how he himself reacts to it. Superman meanwhile is the last of his kind (until Supergirl and Zod show up at least) so that explains why there aren’t more supermen out there. Supes is the only Kryptonian on earth for the most part so therefore no one will ever have the power he does. Wonder Woman meanwhile depending on her origins is either the only Amazon to leave her island or a special warrior created by the gods, so again there is no one like her. The Green Lanterns meanwhile are not unique hence why there have been more than one version of them, Jon Stewart, Hal Jordan, Kyle Raynor etc. With many of the DC comics characters I feel there are less holes in their origins. DC and Marvel have run for many decades and naturally their characters have not aged Nobody wants to see a 70 year old overweight Batman try and squeeze into his tights or an OAP Spider-Man battle arthritis. Thus all of our heroes are kept reasonably young and DC and Marvel have come up with two different ways of doing this. Marvel simply ignores the fact that many decades have gone by. Much like the characters in the Simpsons, Marvels heroes haven’t aged at all or at least aged very slowly as the decades have gone by. This process is referred to as a floating timeline and I don’t think it works quite as well in a serious storyline. Its fine for comedy, hell if anything it can add to the comedy, but in Marvel’s case it sadly makes it seem somewhat silly. Peter Parker has been 28 now since about 1975. Things like the death of John Lennon, the fall of the Berlin wall, 9/11, the war in Iraq, have all happened in about one year in the Marvel universe. Its even worse for Marvel as a large part of Marvel’s appeal is that it’s heroes for all the fantastical, science fiction elements live in a world that is like our own and deal with everyday problems. Its odd thinking that stories in the 70’s only happened at most a few years if even that away from stories in 2016 when obviously the world around them has changed so much. Why didn’t Peter Parker have a mobile phone in stories set in 1969 for example? Also how come the Punisher and Tony Stark are still young men in 2016 despite being Vietnam war veterans? Magneto who was a holocaust survivor should be a lot older than he is now. DC got round this by revealing that all of their stories from the 30’s-mid 50’s took place in an alternate universe to the stories from the 60’s-mid 80’s. This wasn’t simply a reboot however. We actually had the Flash from the 60’s-80’s travel to the universe of the Flash from the 30’s-50’s and the two of them work together. Part of the reason DC introduced this multiverse concept was also to explain why there were different versions of heroes such as the Flash. In the 1950’s the company hit financial troubles and most of their series including those starring heroes such as the Flash and Hawkman were cancelled. The big three, Batman, Superman and Wonder Woman continued to run throughout the decade of course. During the 1960’s DC revived many of their heroes such as the Flash and Hawkman. These versions of those characters however were completely different. They had different, origins, in some cases different powers, and different identities. The original Flash was Jay Garrick, the then modern Flash was Barry Allen. The only problem with this was Batman, Superman and Wonder Woman who had run right the way through had had crossovers with both the old and the new versions of heroes like the Flash and Hawkman. Thus the alternate universe idea was dreamed up to explain this continuity blip more than anything else. All of the stories with the Jay Garrick Flash took place on Earth 2 which had its own version of Batman, Superman and Wonder Woman who were the versions we saw from the 30’s to the 50’s, whilst the stories with Barry Allen took place on Earth 1. Its kind of confusing the way the modern earth was called Earth 1, but that’s only because Barry Allen discovered Jay Garrick’s earth first. The comic that establishes the DC comics from the 30’s-50’s take place in an alternate universe to those from the 60’s-80s, Flash of Two Earth’s. It was really a bonus that the alternate universe also explained why the characters hadn’t aged. When we saw the Batman, Superman, and Wonder Woman of Earth 2 they had all aged accordingly. The Superman and Batman who had been around during World War 2 were now old men on earth 2. Other continuity errors were explained away this way too. The alternate universe explanation I felt was a genius idea that not only got round the heroes not ageing problem as well as some big continuity issues, but it also opened up new and exciting story possibilities that weren’t available to Marvel. For instance DC were actually able to finish their characters from the 30’s-50’s stories. That’s another thing about the floating timeline is that it does feel like nothing can ever change. They can’t for instance bring Spider-Man’s story to a close and kill him off. Okay he has been killed off in the past, same with Captain America, but the point is they aren’t going to stay dead are they? They aren’t going to age, retire, settle down with children because if they do then that’s that no more series. In DC meanwhile the Batman from Earth 2 eventually married a reformed Catwoman and the two had a daughter named Helena who after her mother was killed by criminals became a costumed hero called The Huntress. The earth 2 Batman would later die in battle with a powerful wizard. Remember this wasn’t any old Batman, this was the Batman who had been in every Batman comic from the 30’s-50’s. This was my grandfather’s Batman! Thus his death within the context of the story was quite a big deal. His daughter the Huntress would later travel to Earth one where she would meet its version of her father whom she came to call Uncle Bruce. We also got to see the earth one and two versions of Superman and Wonder Woman meet too, with the two versions of Wonder Woman developing the closest relationship with one another. There were regular crossovers between the Justice Society of America the original superhero team from the Second World War and the Justice League of America the more modern superhero team. Different versions of villains would even meet. The Lex Luthor of Earth 2 who had hair and was a more openly vicious, savage and sadistic character would work along side his bald, more cerebral earth 1 counterpart and an evil version of Superman from earth 3 to try and conquer earth 3.. The multiverse concept was sadly written out of DC in 1985 in the story Crisis on Infinite Earth’s which saw nearly every universe be destroyed by a powerful being called the Anti monitor. The few surviving universes were then merged into one universe called New Earth. All stories post 1985 took place on New Earth and DC thus sadly adopted the floating time line idea too. Fortunately the multiverse was recently restored in all its glory. I’ve always found it lots of fun seeing the Superman from the 30’s, my grandad’s Superman with white hair fighting the Superman of the 21st century in Final Crisis. To me it was just simply a better idea than pretending the characters don’t age. For all of these reasons I prefer DC to Marvel. I certainly don’t hate Marvel and I will admit I do think Marvel did some things better than DC. I think that Marvel were better at making their heroes more relatable than DC. Also I think Marvel generally do teams of heroes better than DC. I do love the Justice League but ultimately I think that the X-Men, Fantastic Four and the Avengers are more interesting than the Teen Titans or the Justice Society. Also I think Marvel has a better track record at making films. In all fairness I think the Batman movies are better than any Marvel film (except for the X-Men), but Marvel still has the better track record simply because they haven’t put all the focus on just two characters. Hell Marvel have been able to bring completely obscure series like Guardians of the Galaxy to the big screen. DC haven’t to date made a solo film about their third most famous character Wonder Woman and so for me Marvel deserves more credit for not just focusing on two bloody characters all the time! Overall DC and Marvel have produced some of the finest characters in the history of sci fi and fantasy and the genre’s would surely be a poorer place without them. But in my opinion DC is just that little bit better than Marvel. For the record though my second favourite hero is Spider-Man, but Batman is still my all time favourite. Great article. You are bringing up some Points that I myself have been thinking about since I started to read DC comics. The first point you mentioned is especially one. I think DC is better with different genres and thus making it’s universe bigger. Superman is hopefull, more utopian, Batman is dystopian and is mixture of crime/detective genres. Wonder Woman is tied to mythology, GL is science-fiction, Swamp Thing horror etc. Sure Marvel has Thor and Guardians of the Galaxy but they are not big hitters or just as important as WW and GL. I have always wondered why there isn’t more heroes like Spider-Man in the marvel universe for exactly your reason what happened to the spider that bitten Peter. I don’t really get into who’s better marvel or DC because I haven’t read any comics but when I read up on characters I do think that DC has much more interesting villains then Marvel. For the films old DC movies like batman forever and the original superman movies were amazing but then with the Nolan trilogy DC lost it for me. I do think suicide squad may give me hope for DC again.